To kick off Oracle OpenWorld, we wanted to provide the Bitnami community with an update on all of the things we have been doing with Oracle! Bitnami has provided Oracle with up-to-date and secure images on the Oracle Cloud Marketplace for over two years, which has led to the expansion of the relationship as Oracle continues to provide more and more options for users to test the power of their cloud infrastructure. 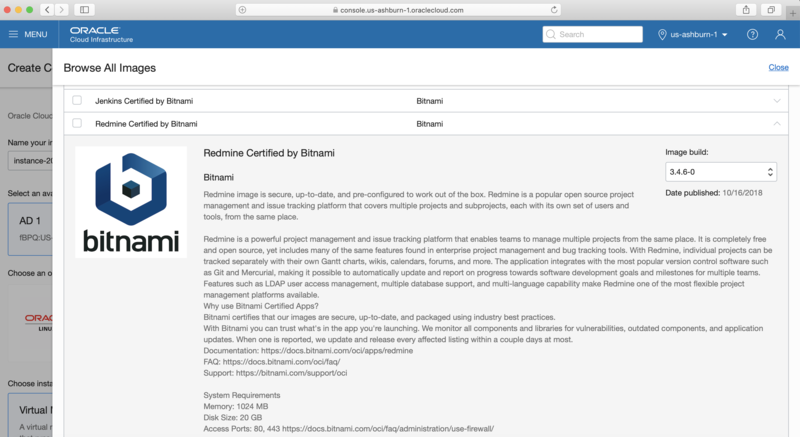 Now, we are proud to announce that you can enjoy the security and consistency of Bitnami applications within Oracle’s new solutions and training environments mentioned below. Our solutions allow you to demo our applications quickly, get training with hands-on exercises, and then easily deploying a production ready application to further your testing needs. Pick the option that suits your needs best. Test the power of the Oracle Cloud Infrastructure for free with the new Oracle Cloud Jump Start Demos. You’ll be able to try a pre-configured Bitnami Demo Lab within a matter of minutes, which will give you a glimpse into the possibilities that the Oracle Cloud can bring your team. These Self Paced Labs will give you the ability to learn about the Oracle Cloud Infrastructure while using one of the familiar Bitnami applications as the basis for your course. In these 1 hour courses, you’ll be able to launch an application, test the OCI features, and explore at your own pace with hands-on exercises. Get started today with Jenkins or Sonarqube. Spin up a Jump Start Launch Image or Launch Stack for the full production experience as you continue your testing. The Jump Start Launch program provides great reliability and a solid foundation for your proof-of-concept. These deployment options will give your team the opportunity to evaluate the combination of the application’s features with the power of the Oracle Cloud Infrastructure without having to build everything from scratch. The Oracle Cloud Marketplace will now be included within your Oracle Cloud Infrastructure console. In addition to this, Oracle has also added the ability to launch applications directly on your environment via a Partner Image Catalog. Before the Partner Image Catalog, it could take days or weeks to spin up an application on your servers, but now it will only take you a few moments. The click-to-deploy option now gives you the freedom to get started with your Bitnami projects quickly and efficiently. Login into your OCI console now, and check it out! 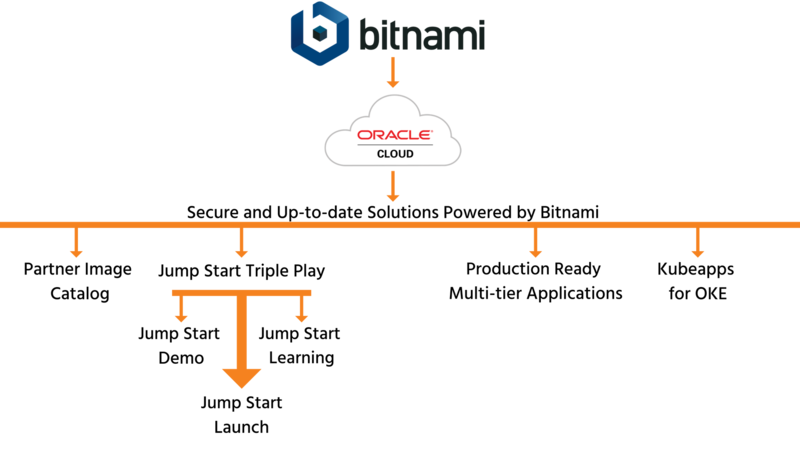 Bitnami Multi-Tier templates are now available in the Oracle Cloud Infrastructure. These Terraform architecture templates allow you to easily move your deployments from development to production while providing high availability and performance in medium/large size production environments. Follow our guide as we walk you through the process of using the Terraform Provider plugin and the Terraform CLI to deploy the Bitnami MySQL with replication on an Oracle Cloud Infrastructure server. The guide will teach you how to configure the Terraform CLI, the OCI plugin and how to configure it with your OCI account for the best performance of your new Multi-Tier application. Kubeapps is a web-based UI for deploying and managing applications in Kubernetes clusters, which can now be used on OKE clusters to get access to hundreds of Helm apps. The Bitnami Kubernetes team has been working hard to ensure that the Kubeapps experience on top of OKE clusters provides the same ease of use that you’ll find when running it on any other cluster. Learn how to get started with our guide here.